What is the Global Film Festival? Visit the Facebook page here!! Or click the link to the left. And be sure to become a fan and invite all of your friends! Check out our Flickr page to see photos from the festival weekend. Click the link to the left to head over to the site. 2/18/10: IMPORTANT BLIND BOYS EVENT INFORMATION!! We’ve had a lot of questions about our very popular Blind Boys of Alabama event on Sunday evening. First, Blind Boys tickets will be available for pick-up at all times that the College will-call table is open. That means students can pick up tickets for Blind Boys as early as TODAY at 4:30 p.m. Secondly, this means tickets will be available at the KIMBALL, not the Sadler Center. We will bring over the tickets to a table outside the Commonwealth auditorium immediately preceding the Blind Boys show, but otherwise tickets are available at the KIMBALL starting TODAY. And third, a W&M ID, student or faculty, is required to pick up a ticket. Only one ticket per ID. We will be posting more details later, but for the rest of the public unable to get tickets, there will be an overflow room with a simulcast set up so that you may enjoy the concert as well. 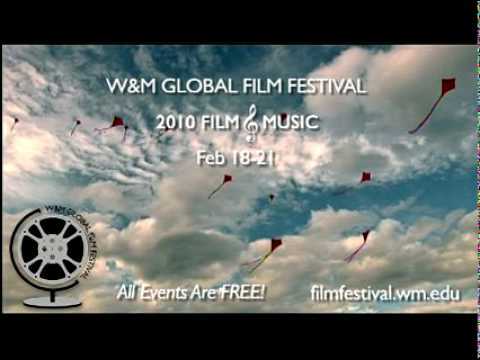 Festival coordintor, Tim Barnard, along with intern Mike Erickson sat down with Adam Stackhouse of 90.9 WCWM this morning to discuss this weekend’s film festival, and they had a great conversation that’s really worth a listen. You can check it out here on the station’s facebook fan page. Also, the festival was again covered in William and Mary’s Flat Hat, in an article that gives a behind-the-scenes look at how the festival has been leading up to this coming weekend. That article can be found here. Gilad Woltsovitch, drummer for NiCad is coming to Williamsburg! On Friday, 2/19, he will present the winner of the NiCad music video contest that kicked off last semester to students at the College. He will also participate in the filmmakers/musicians roundtable on Saturday. For detailed information on the schedule, click here. And to see some of NiCad’s visit to the College last year, visit FlatHatNews.com. The W&M Global Film & Music Festival is partnering with Ruritan to support the global community’s relief efforts in Haiti. Cash donations will be accepted by Ruritan members immediately before select festival events throughout the festival weekend. Help out Haiti and enjoy a free once-in-a-lifetime cultural event all at one time! The festival is pulling out all stops for optimal Audio and Visual presentation of its films, flying in top line special projection equipment for the digitally presented films included in the program. Equipment will allow for a Kimball Theatre first: A HIGH DEFINITION FILM SCREENING! Heima, showcasing Sigur Ros’s Homecoming tour of Iceland, will be presented as it is meant to be, in maximum high definition. Director Dean Deblois (see earlier news flash below) will also be there to present. Festival Director, Tim Barnard, will be interviewed on WMBG 740 AM , “Williamsburg’s Radio Station,” this afternoon! He will be discussing next weekend’s film festival with Greg Granger. Visit the station’s website at http://www.wmbgradio.com. Victoria Racimo, arts and culture contributor for the WY blog, recently wrote an article on the upcoming Global Film Festival: Film and Music. In it, she says, “what [festival coordinator, Tim Barnard] and the College along with the Reves Center and other outstanding community leaders are doing could very well, in time and with enough forbearance and continued vision, put Williamsburg on the map as a destination for film lovers and filmmakers across the country. And in turn, the dynamics to this burgeoning artistic film “convention” are continued insistence and awareness, pure and simple, of our community’s involvement both as doers and as audience. Here is an arts group already in our midst. Hail to entrepreneurship with an idea and a plan.” Read the full article on WY Daily’s blog here. 2/10/10: Director WILL introduce No One Knows About Persian Cats… from Istanbul!! Bahman Ghobadi, director of No One Knows About Persian Cats, is scheduled to introduce his film virtually, live from Budapest, for its Virginia Premier at our festival. The accomplished Kurdish Iranian director, whose film is scheduled to screen on Saturday, 2/20 at 7pm, will be interviewed by William and Mary’s Iranian-American students on-line in advance of the film screening. We will then pipe Mr. Ghobadi in to the Kimball Theater live so that he can be with us virtually, as he is currently traveling the world promoting this film that was all the buzz at Cannes last Spring. W&M student Hanif Yazdi will serve as Mr. Ghobadi’s translator. The festival is just over a week away, and to give you a look at some behind-the-scenes right before (and during) the festival weekend, we’ve set up a blog at http://filmfestival.blogs.wm.edu/. Interns will be updating periodically to the site in order to give you an insider’s look into this exciting festival. Be sure to check it out. William & Mary’s student paper, The Flat Hat, featured this year’s festival in its latest issue. Read the article here……………………… ……………………………………………. ………….. …………….. ………….. …………… ……………. ……………. …………… ………….. …………… ………….. ……………. …………….. …………….. ……………. ……………. …………..
Watch it at the top of the page, or watch it over on YouTube here. Tomorrow, Feb. 3 at 7pm at the Williamsburg Regional Library, we will be screening the highly acclaimed Once in conjunction with the Celtic Film Festival. Presented by W&M English and Women’s Studies Professor Christy Burns, this film, blending music, romance, and amazing cinematic storytelling, is truly singular in what it contributes to this year’s festival theme of Global Film and Music….plus it is just a rockin’ good movie. Come early, because this is likely to draw a very BIG crowd. It’s free with no tickets required, but the WRL will turn people away once the theater is maxed out. See you there! Recently, Blind Boys of Alabama appeared with Lou Reed on The Late Show with David Letterman. The gospel group, who was featured in the film Soundtrack for a Revolution, which will have its Virginia premiere during festival weekend, will be closing out the festival in what’s to be an amazing show. You can get a taste of the “boys” by checking out their performance on Dave Letterman here. 1/29/10: Prince Achmed to be shown on restored 35mm print! Prince Achmed is beginning his latest “adventure” and is on his way to Williamsburg, VA! Join us at the Kimball Theatre on Saturday, February 20th to see the beautifully restored 35mm print of The Adventures of Prince Achmed(1926), the world’s earliest existing animated feature film. Dreamland Faces, silent film accompaniment virtuosos, will also be making their own adventurous voyage to Williamsburg with Accordion and Musical saw in tow, as they will be providing live music accompaniment for Achmed that they have composed expressly for our festival! Do you have any questions not answered on the website? Please contact either Timothy Barnard, festival coordinator, at tlbarn@wm.edu or Austin Journey, webmaster, at austin.journey@gmail.com.